The travel industry of Turkey in years gone by was very different to what we see now. People didn’t travel for leisure unless they were of the upper-class members of society such as the literary great Mark Twain, the female pioneer Gertrude Bell or the Ottoman version of Marco Polo, who was Evliya Çelebi. Aside from the affluent members of society, people mainly traveled for business, to sell their wares and tares and the perfect example of this is the ancient silk route that stretched from Asia to the western world. This route predominately passed through the Anatolian region of Turkey before heading northwest to the bustling trading capital of Constantinople. Obviously, though the traveling salesmen needed somewhere to rest at night and they preferred the version of the modern hotel that was a Caravanserai. (Also written as kervansaray) Not only did these places offer a bed, food, and drink, but the salesmen were protected against bandits that in those days was a common problem. The last caravansary that I visited was the Tarihi Yenihan in Gaziantep, but travel guides and books generally agree that the Central Anatolian region is home to some of the finest ancient caravansaries of Turkey and the Seljuk Turks whose footprint in history is clearly defined by their style of architecture built most of the majestic structures. Most of the best ancient caravansaries are hard to reach by public transport and without the use of a car. 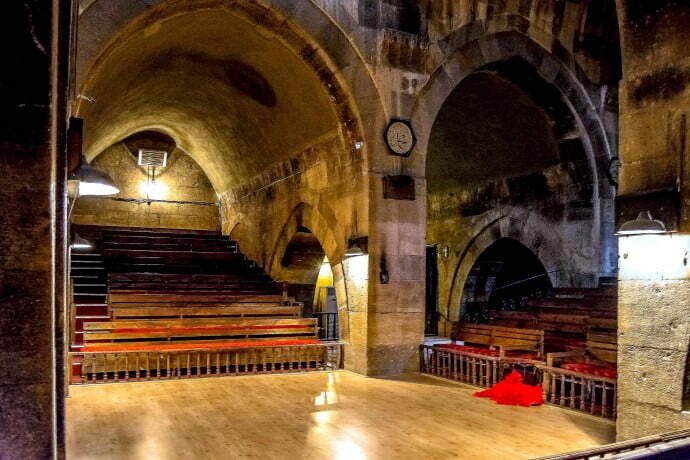 Therefore, my friends, Erkan and Kadir, who are local guides over at Turkey Tour Organizer suggested the easiest one to get to was Sarihan, which they could take me to during the day or I could book a ticket for the evening Whirling Dervish show that is a popular tourist attraction of Cappadocia. I opted for the daytime tour since it meant I could explore at my own pace. 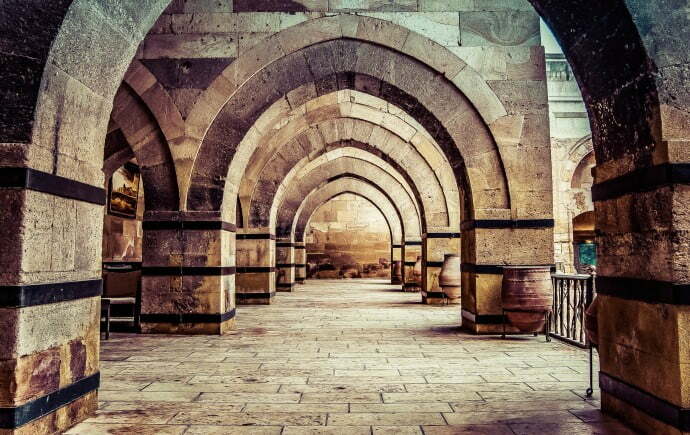 Also known as Sarihan, it was the last Caravanserai to be built in the area, in 1259. The first dominant feature, as I stood outside of the building, was the two shades of the stone. This is easily explained because while the bottom half is the original building, the top is reconstruction. From the big, gated entrance, I entered into the large interior courtyard but unfortunately, lack of signage within the Caravanserai makes it hard to determine which room was used for what purpose. On the left was a domed seating area, while on the right, were small doorways into even smaller rooms! 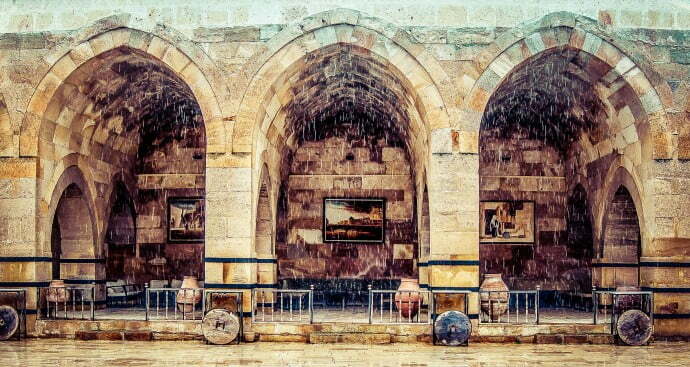 We know that the chamber above the elaborate entrance was a masjid (an alternative place for Muslims to pray, other than a mosque,) which makes this Caravanserai unique since, in most others, the prayer area was in the middle of the courtyard. 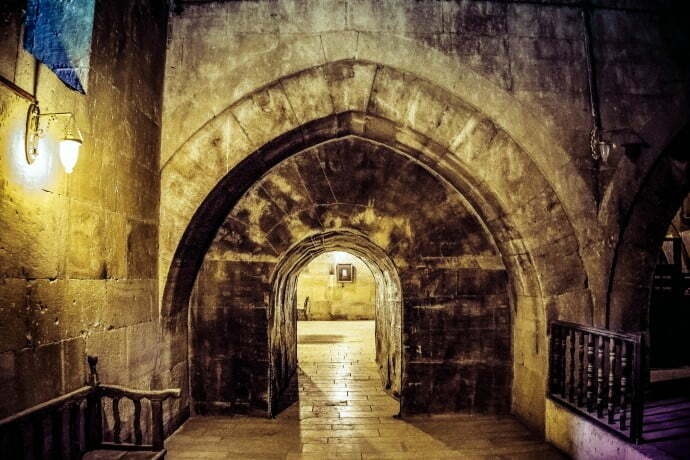 At the opposite side of the entrance, is likewise an elaborate door leading into a dark hall, with an arch dome ceiling where the whirling dervish Sema ritual is performed. At nighttime when lit up for the ritual, it is probably clearer, and the architectural style would be more evident. 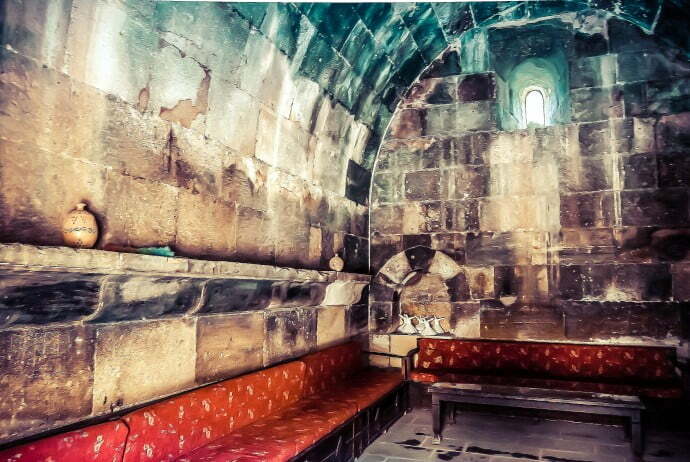 It takes no longer than 30 minutes to explore the Sarihan Caravanserai that sits on the outskirts of Avanos, however if you want to explore the concept even further, the Sultanhani and A?zikarahan are considered to be the best preserved. 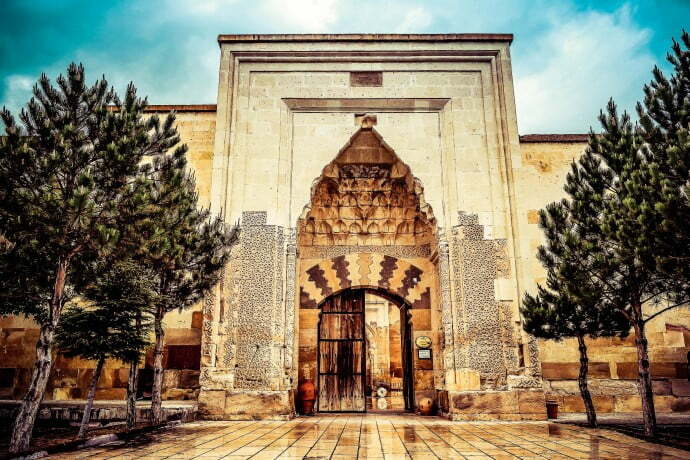 Ideally, you need a car to reach them since they are quite a distance from town centers or alternatively, speak to Kadir and Erkan at Turkey Tour organizer about their private day tours and tickets for the evening time whirling dervish shows at Sarihan Caravanserai.